Maya: My life has always been about taking care of people. So I find myself protecting an injured stranger, even when instincts tell me he’s trouble. I never meant to fall in love, and at least I was right about one thing. He was trouble, and before I know it I’m left in the dust. Gone, with only the precious gift inside me as his only trace. There’s only one thing left to do now: keep this child safe…and to do that I’ll need to do everything I can to keep the father from knowing it exists. Matt: How could I ever repay her? She saved my life. A life I never asked for, but a life I live. She was the prettiest thing I have ever seen. Even as hurt as I was I couldn’t stop myself from wanting her with everything I had. I had to cut her loose though. It was a mistake to let myself get carried away in the first place. I’ll only break her heart worse down the road… or worse. In my world, one wrong move will get us both killed, and a pretty thing like that deserves better. 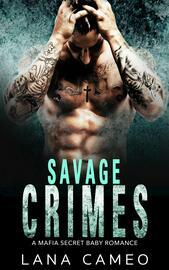 Warning: “Savage Crimes: A Mafia Secret Baby Romance” contains mature language and scenes. It is intended for adult readers. No cliffhangers and an HEA is a guarantee.